Obsessed with noodles? Us too. Whether it’s chewy stands of ramen soaking in a bowl of hot, fatty, pork-based broth or homemade udon under a thick layer of Japanese curry, noodles are the quintessential comfort food once cold weather strikes. In the West, we’re spoiled with quality noodle shops from trendy Tokyo lookalikes to casual neighborhood joints. Here, we rounded up the 17 best noodle restaurants that do it right. At this ramen shop in L.A.’s Chinatown, choose between traditional ramen and tsukemen, “dipping ramen” in which fresh noodles are rinsed cold and served with hot broth on the side. Batches of fresh strands are made in-house every day, while the pork-based tsukemen broth is a three-day-long labor of love. Hip Japanese beers, Tokyo-like exposed wood interiors, and an impressive izakaya menu make this spot a popular choice for first dates. Settle in at the bar or a table, start with a plate of sashimi, then make your way to hand-rolled udon. Don’t miss out on the Kama Tama Udon; it’s the restaurant’s take on carbonara with a raw Riverdog Farm egg yolk, butter, ginger, scallion, and freshly shaved katsuobushi (dried, fermented, and smoked skipjack tuna). Portlanders swear by the ramen at Marukin. 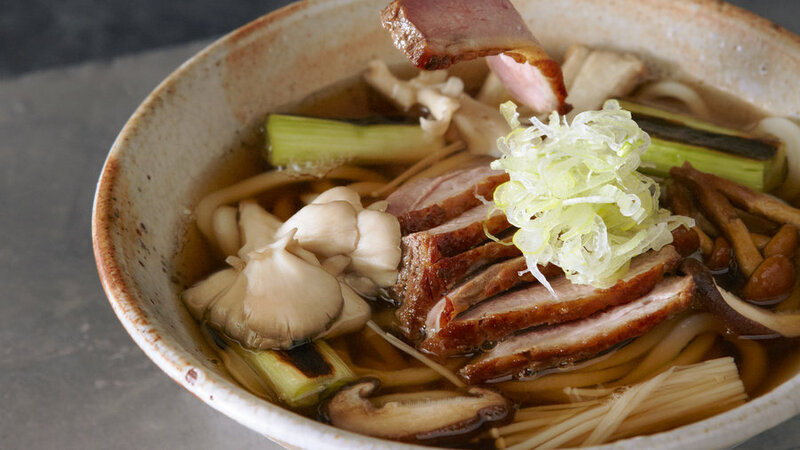 Chef Mayumi cooks up classic broths like tonkotsu, shoyu, and miso, but also serves lesser-known soup bases like paitan (Japan’s answer to cream of chicken soup) and tonyu (lighter bodied, slightly sweet broth). Tip: Order your ramen “red” for a sinus-clearing level of spice. Ramen Tatsu-Ya is on a personal mission to educate people about ramen, which they call “the soul food of Japan.” Bowls are filled with thin, delicate noodles and accoutrements are generously piled on top. Diners can add “bombs” to their noodles—a “corn bomb” includes butter and corn while a “yuzu koshu bomb” adds Japanese citrus, serrano chile, jalapeño, and garlic. Lines form down the block for Marukame Udon’s freshly made Sanuki-style noodles made with 100 percent Japanese-imported wheat flour. Choose from classics like niku udon (traditional broth topped with sweet beef and caramelized onions) or heartier options like curry udon, then top it off with crispy toppings at the serve-yourself tempura bar. The Bay Area was in serious need of a noodle shop specializing in soba until Soba Ichi opened its doors in June 2018. While most Japanese restaurants use pre-made soba, this West Oakland spot mills fresh buckwheat flour and turns it into clean, simple soba noodles. Natural wood tables set the Zen mood here, and indoor and outdoor seating options are a rare noodle shop luxury. Arashi is Seattle’s cure-all for the city’s gray, rainy weather. City dwellers line up at this casual dinner spot for the Miso Tonkotsu, a pork bone-based miso broth topped with noodles, pork belly chashu, bean sprouts, green onion, sweet corn, and a soft-boiled egg. Come here hungry. This neighborhood spot in the Lower Highlands centers around the chef’s high-top counter, where fresh ramen and small plates make up the menu. There are only five staple ramen varieties here, with the duck confit option being the most unique of the bunch. When you’re not up for a decadent Las Vegas hotel buffet, there’s always a filling bowl of Chinese-style soup noodles at Shang Artisan Noodles. These springy, thick noodles are served with a deep meat-based broth (either pork and chicken or beef) and topped with anything from tender pieces of beef shank to bok choy. Don’t be mistaken: This sister restaurant of famed Tsujita LA Artisan Noodle is anything but a runner-up option. Here, the handmade noodles are thicker than average and the rich pork-based broth is in high demand. Sit at the ramen bar and watch chefs roll, cut, and boil noodles while you wait for your steaming bowl of soup to arrive. Unlike San Francisco and Los Angeles, Phoenix isn’t a city that’s known for its Asian food scene. This restaurant is changing that with its generous pours of broth and standout toppings. Aside from chashu-topped ramen and Sichuan-style soups, the casual spot also serves Italian pastas (yes, really) in case you’re not in the mood for Japanese. This ramen joint in Honolulu’s Chinatown is the spot for a big bowl of chewy noodles swimming in a pool of savory, sesame-like broth. The hip restaurant (think reclaimed wood decor and brick walls) offers traditional toppings like bean sprouts, wakame, sesame seeds, green onion, ginger, and a soft boiled egg, as well as more interesting options like The Belly Bowl (ramen topped with brisket, short ribs, and oxtail won tons). This modern noodle joint is the first location outside of Japan for Hidoneya, a popular ramen chain from the city of Hasuda. Don’t leave without a bowl of the house ramen, where traditional dashi broth is brimming with umami flavor. After your meal, walk through Japantown’s onigiri-filled supermarkets and matcha ice cream shops. High ceilings, an open kitchen made for people watching, and a decked-out sake bar make this noodle bar a favorite spot for a midweek dinner with friends. This is the first location outside of Japan for Afuri, but the ramen is just as authentic as any you’ll find in the alleys of Tokyo. With locations throughout the city, this Seattle mini-chain makes sure you’re never too far away from a bowl of soupy goodness. Garlic Tonkotsu is a must here—the restaurant uses extra-rich shoyu-flavored pork broth and, of course, a heavy dose of garlic. This downtown Phoenix spot serves all the classic flavors (shoyu, curry, tonkotsu) using ramen from the cult-favorite noodle supplier Sun Noodles. Appetizers include the usual suspects as well—think pork gyoza and karaage (Japanese-style fried chicken). Familiarize yourself with the basics of udon at Cafe Sanuki. Meat eaters can nosh on the straightforward niku beef udon (hot udon in broth topped with seasoned beef), while vegetarians can order the kitsune udon (hot udon in dashi broth topped with fried tofu). While you’re here, sample a cold udon dish like ontama udon—cold wheat flour noodles topped with a poached Japanese imported egg.